The Dogs My Love Genuine Leather Collar is studded and decorated with rhinestones and flowers. It has a unique shape that widens and tapers both at the ends and in the middle. The leash ring is located in the center. 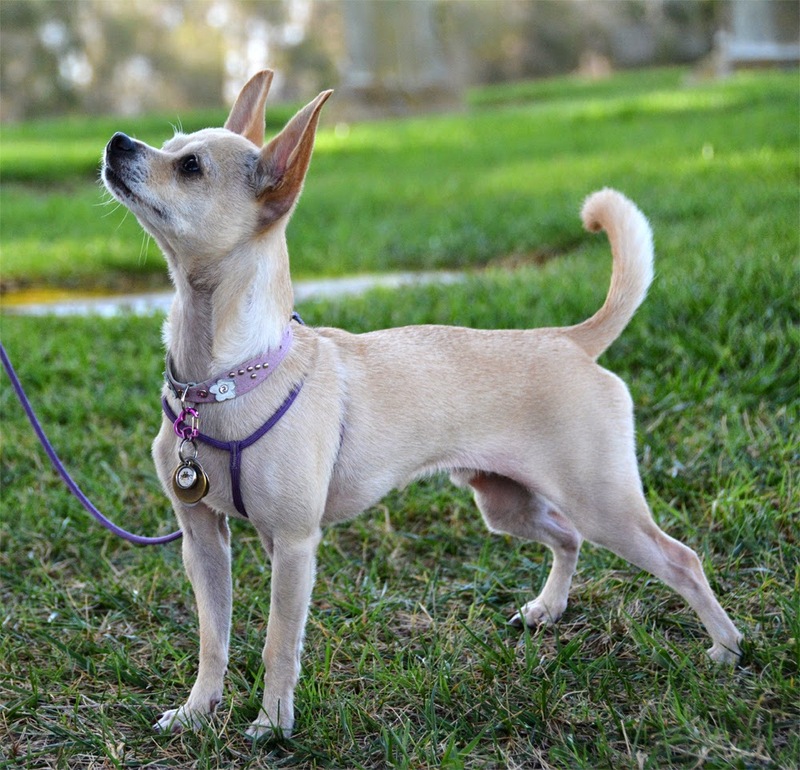 This collar is available in several colors and two sizes to fit dogs with necks 8" to 13" around. I found this super cute collar while looking for itty bitty collars on Amazon. This one was about $12 and it is perfect for Ru. The leather is very soft and flexible, and the whole collar is very light. It's not a flimsy collar. Well, I suppose it would be if it were for a bigger dog. Still, I am not at all worried about it falling off. I only use it to hold tags, I never attach a leash to Ru's collar. Pros: Too cute! 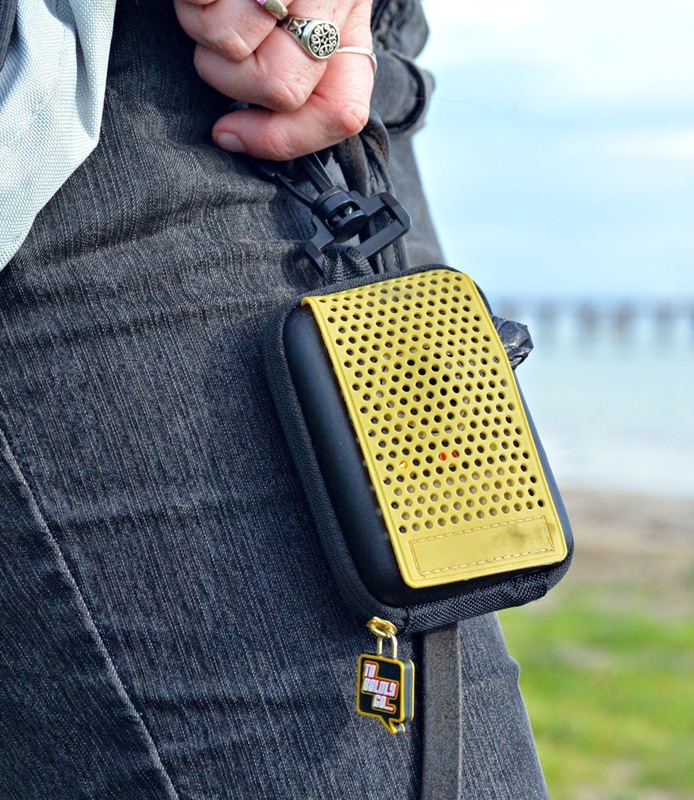 Light and flexible enough to be comfortable on a wee delicate dog. Cons: Very limited size range, really just for itty bitty dogs. Bottom Line: An inexpensive way to pretty up my tiny dog. 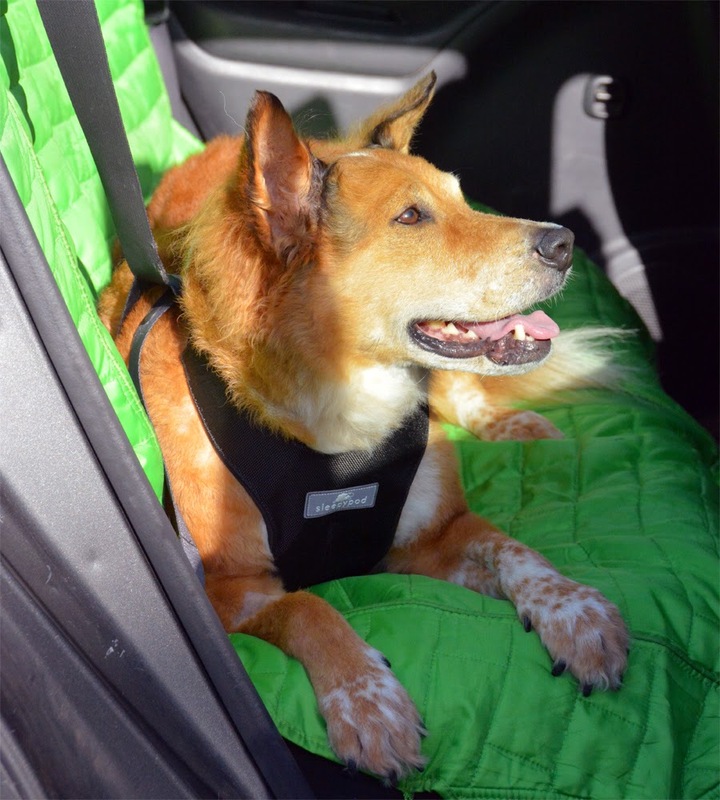 The Kurgo Loft Bench Seat Cover is a waterproof cover designed to make the back seat of my car a little more dog friendly. It is waterproof, padded, and stays in place nicely. This seat cover is reversible and comes in two color combinations. Since I started using the SleepyPod Clickit harness for Brisbane, I needed something with seatbelt access for my car. My Fuloon hammock is perfect for containing sand after a trip to the beach, but its bucket-like nature prevents me from strapping Briz in. I like dog hammocks in general because they prevent my dogs from falling into the gap between the front and back seats. That's not an issue when they're strapped in, so the Kurgo Loft seat cover works just fine. Unlike most seat covers, this one seems to have been made for seats that have the ability to fold down. In addition to straps that go around the headrests, there is a big wid strap that goes all the way around the back of the seats. This helps anchor the cover and keep it in place. Pros: Easy to clean, easy to install, stays in place. Allows access to seatbelts. Cons: The standard size is a little small for my Toyota Matrix, which is not a large vehicle. Bottom Line: I find the coolest stuff in thrift stores. What do you use to protect your car seats? These PetSafe Indigo Catfish Po' Boy treats arrived in our February Allergy-Friendly BarkBox. They certainly fit the Mardis Gras theme of that particular box. 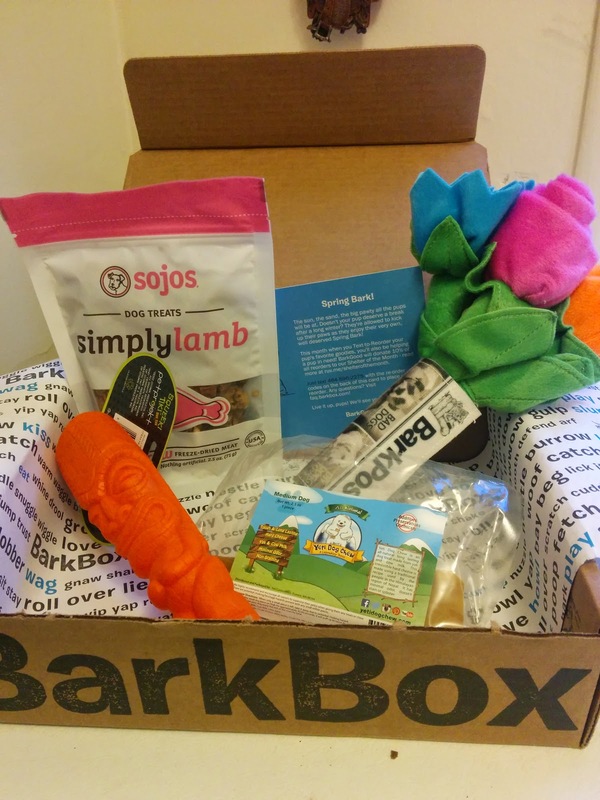 While we haven't tried this particular flavor before, we did get some pork ones in our September BarkBox. These are very special treats because they are highly perishable and need to used up right away. Good For: Dogs with allergies to things that aren't catfish or pork. High value treats if I cut them up into little pieces. Not Good For: Forgetting inside my treat bag for a week. How Much We Like Them: Not enough to go looking for them in my local stores, but enough to use the ones we get in our BarkBoxes. The Pet Qwerks Pawpcorn toy is a stuffy that squeaks and crinkles. It arrived in our March Allergy-Friendly BarkBox, and nobody liked it. Not even Darla the foster puppy, who was adopted by a very nice retired couple on Friday, liked this toy. I think it's the crinkling. Neither Brisbane nor Ru like toys that crinkle. The foster puppies all seemed to like them ok, but this one just didn't catch anyone's attention. I ended up contacting BarkBox to use their Scout's Honor guarantee. Pros: Seems to be well made and durable. Very crinkly. Cons: White color looks dirty instantly. Too big around for medium-sized dogs to get their mouths around. Very crinkly. Bottom Line: After a lot of coaxing, Briz made a half-hearted attempt at shredding this toy. I should see if Xena likes it, she likes weird stuff. As far as I could tell, Dog. Dog. Cat. had every size and color of every Ruffwear jacket in stock right there for us to try on. They also had all of the Hurtta coveralls and jackets available in the USA, in every size. Those things come in a whole lot of sizes, so being able to compare the fit without having to buy everything and have it shipped to me was amazing. I love playing dress-up with my dogs. What else did we get to play with? They had every color and every size of Ruffwear Front Range harness. I got to try an XXS on Ru and find out that, while it technically fits, it is entirely to bulky for a 6lb bitty dog. They also had every size and color of Hurtta Padded Y-Harness, so I could see for myself that the size in between my 39" and 28" harnesses does actually fit Brisbane rather well. I wanted to buy absolutely everything. Ultimately we came home with a Moo Tug for Briz, and a Ruff Puppies collar for Ru. 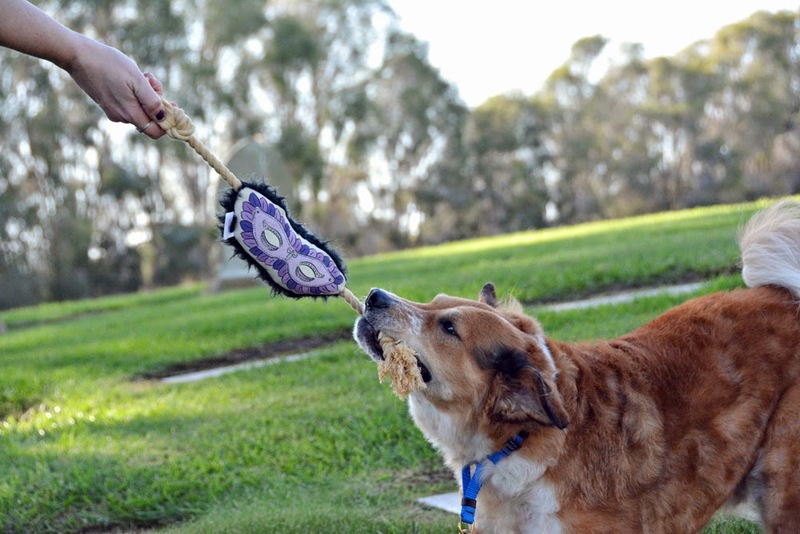 This Harry Barker Stuffed Mardi Gras Mask with Rope toy arrived in our February Mardi Gras-themed BarkBox. Like our other Harry Barker plush toy, the mask is made from canvas with a picture printed on one side. 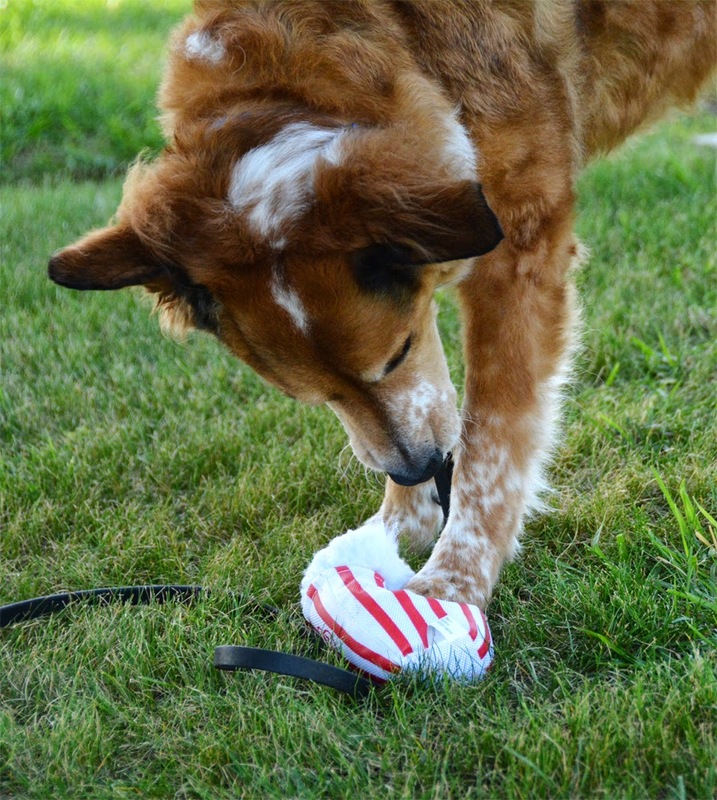 It has a natural rope for tugging on either end, a squeaker inside, and some fuzzy trim on the back. This is the smaller size of the mask toy, there is a larger version available. I am always a little leery of plush tug toys, especially the ones with ropes attached. Brisbane had several cheap ones in his younger days, and they all ended up getting the ropes ripped out of them within a day or two. This is a well-constructed toy. The fatal flaw in our cheap rope-and-stuffy toys was the fact that multiple ropes were stitched to the toy but not each other. When a toy like that is tugged, it rips apart. 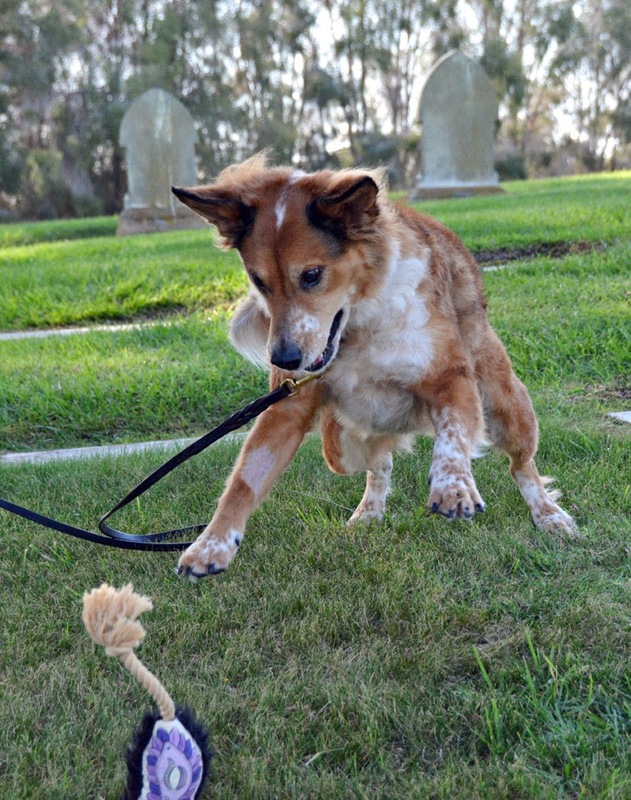 Happily, this Harry Barker tug toy has the rope running all the way through it. It has lasted through quite a bit of tugging, shaking, and tossing with no signs of wear. 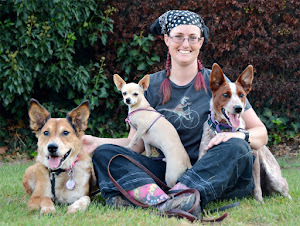 Brisbane loves the squeaker, and the foster puppies love to shake it so that the ropes hit them in the face. Pros: Durable enough for actual tugging. Stuffed with eco-friendly fiberfill. Machine washable. More fun that a rope-less plushie. Cons: A serious chewer will be able to shred this toy immediately. Bottom Line: I'm not a huge fan of Mardi Gras, but this is a pretty neat toy. I bake a birthday cake for Brisbane every year. It is always frosted with cream cheese, and usually made from whatever I have around the house. Last year was applesauce banana oatmeal hamburger cupcakes. This year I made a bacon applesauce peanut butter cake. Cooking for dogs pretty awesome because it's basically impossible to mess up. Like my husbands co-workers, dogs are happy to eat whatever you make, no matter how it turns out. Soggy? Cool. Crumbly? No problem! Greasy? Awesome! Tasteless? Tasty! I often make cupcakes for Brisbane's birthday because I can just slap a pile of cream cheese on top no matter how they come out. Add sprinkles and they look deceptively like regular old cupcakes. 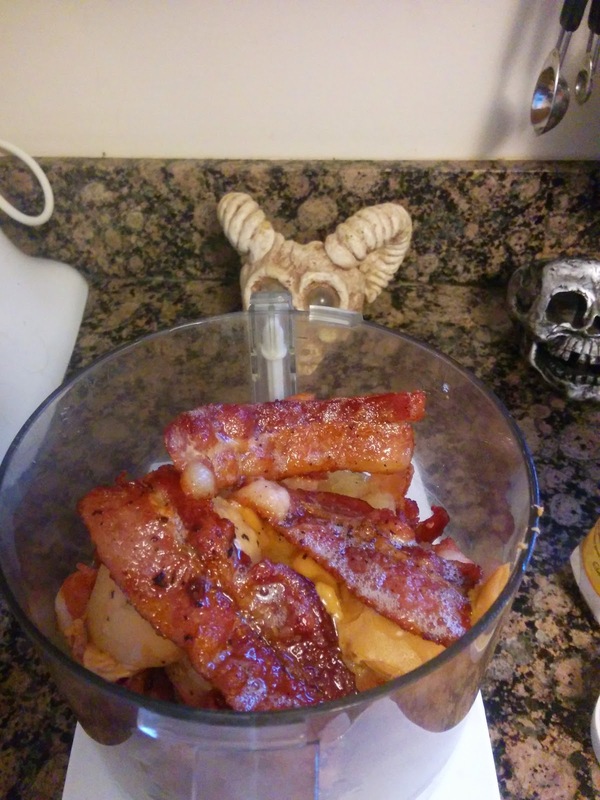 Following my foolproof method for making dog cake (something tasty, something wet, something dry) I started by browning several strips of bacon. I like maple-flavored chewy bacon, Brisbane is significantly less picky and likes all forms of bacon and bacon-like foods. 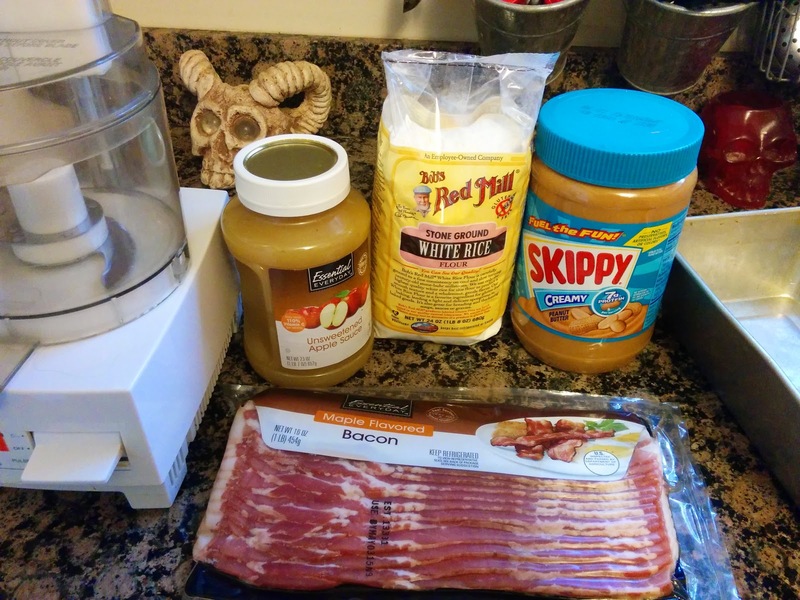 Next, I added a few spoonfuls of applesauce and peanut butter and whizzed it in the food processor with the bacon. I used rice flour for this cake, adding a little at a time until I got the consistency of cake batter. Had I wanted to make a grain-free cake, I could have used potato flour, garbanzo bean flour, almond flour, etc. My goal for this cake was to end up with something I could frost and decorate like a tiny sheet cake. I baked this one in a loaf pan, so it came out long and skinny. Once it had cooled enough, I dumped it onto a cutting board and sliced it into a more pleasing rectangle. 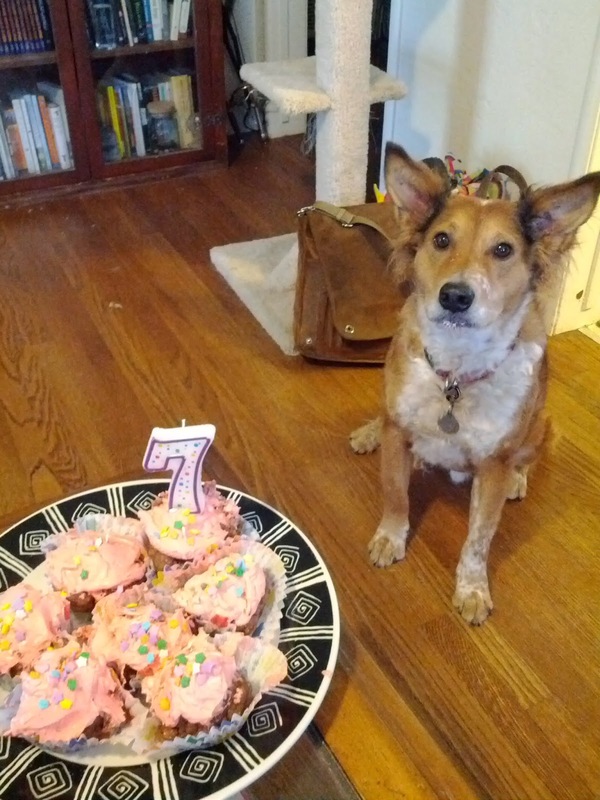 Cream cheese spread makes a great non-sugary frosting for dog cakes. Some years I add food coloring, this year I left it white to keep up the sheet cake appearance. It spreads best when the tub has been left out of the fridge for a couple of hours to warm up. The decorative touches on this cake are made from store-bought decorator frosting. I might be able to pipe cream cheese like decorator frosting, but it's tough to get the right consistency and this year I was feeling sort of lazy. 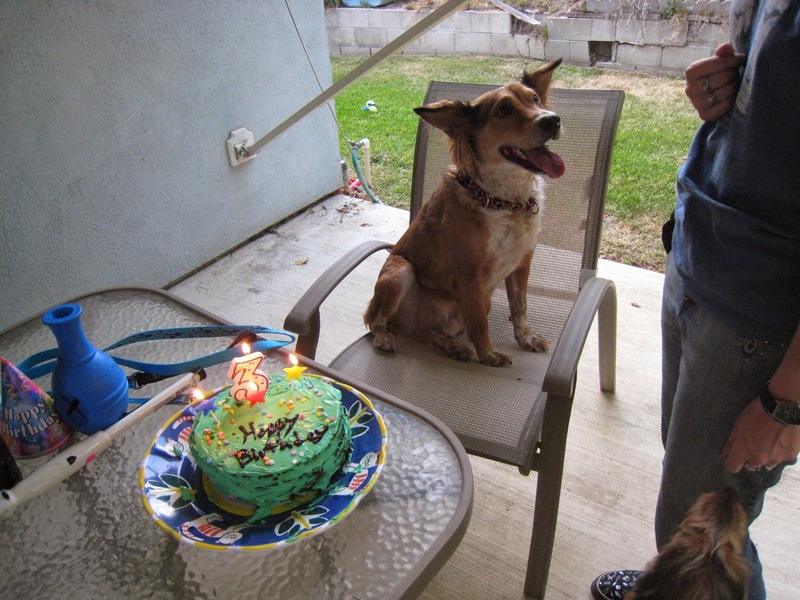 I think this year's dog cake came out rather well. It still looked like a miniature sheet cake when sliced. It did have five or six strips of bacon in it, but nobody here has had any tummy trouble after eating it. If my dogs had any history of sensitive stomachs or pancreatitis I probably wouldn't be feeding them bacon and cake frosting. This is a once-a-year treat. 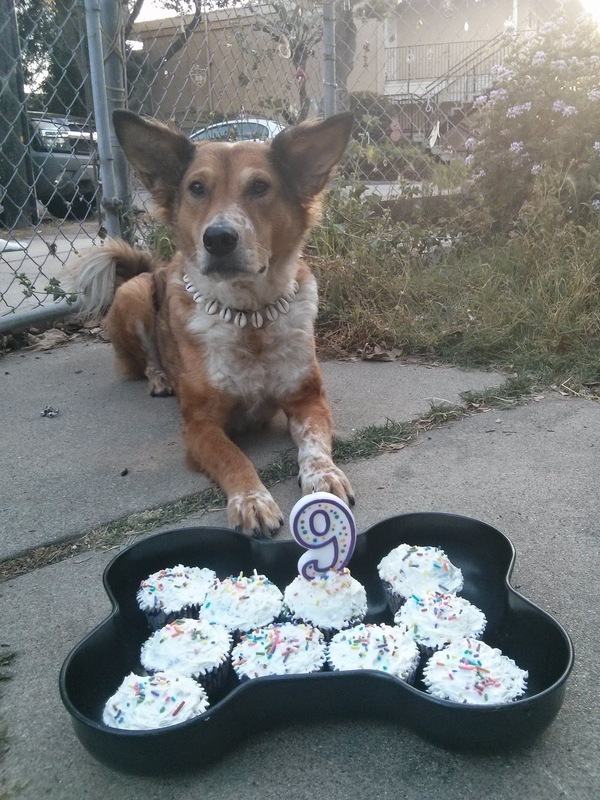 Brisbane turned ten today, he has now graced the world with his presence for an entire decade. He has developed a bit of arthritis over the last year, and might be finally starting to slow down a little, but he's definitely still going strong. For his birthday this year, I decided to book him an appointment with HydroPaws Animal Rehabilitation and Performance Center. 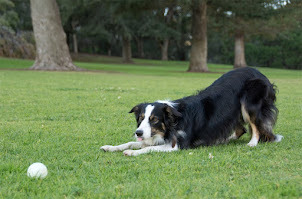 We've been doing lots of core work and body awareness exercises to help mitigate Brisbane's lifelong spine issues and help keep him as active and comfortable as possible as he ages. I joined a Canine Conditioning and Body Awareness group on Facebook last year. Since then, Briz has learned how to target things with his rear feet, walk over cavaletti poles, and perch on a small stool. We're working on handstands and holding beg and bow positions. 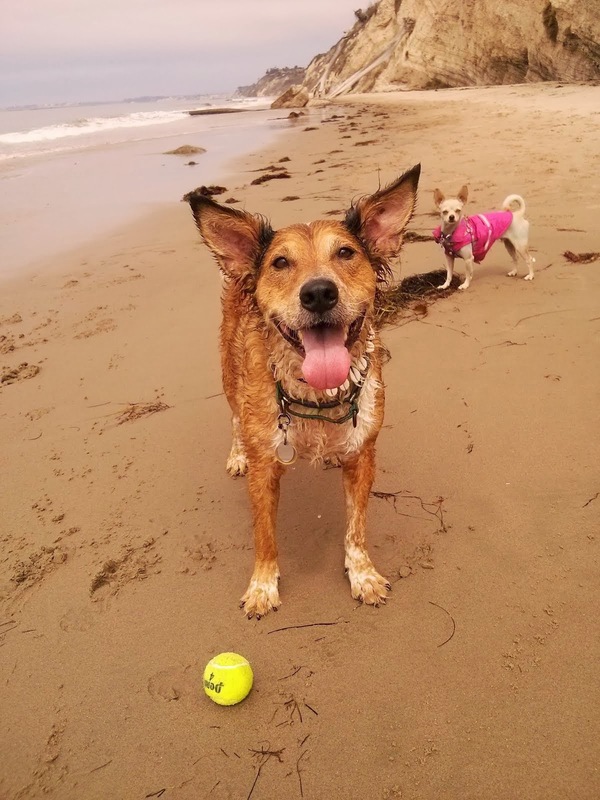 The Facebook group encourages everyone to visit a rehab professional at least once to learn as much as they can about their dog's structure and abilities. I've got plenty of ideas for things to do with Brisbane, but I'm a little fuzzy on the specifics. How much core work is too much? How often is too often? I'm looking forward to having a rehab professional look at him. 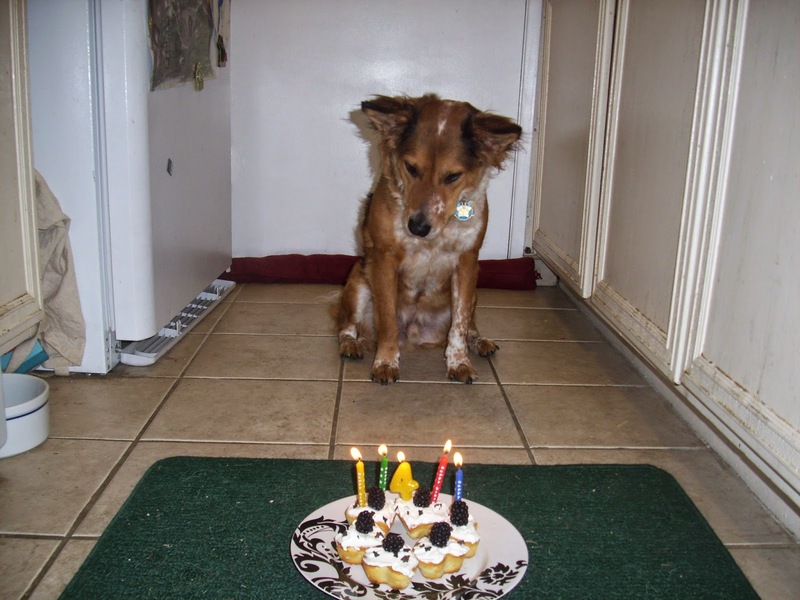 As I mentioned last year, the Briz-cake picture in an annual tradition. This P.L.A.Y. King Crab stuffy arrived in our July BarkBox, the last chicken-tastic box we got before the new allergy-friendly option was introduced. This is a sturdy plush toy with heavy duty seams. It is part of P.L.A.Y. 's Under the Sea collection. I've referred to the P.L.A.Y. Crab many times, usually in reference to our stuffed squid from the same collection. I love that squid. The dogs love that squid. This crab is cool too though, and this review is way overdue. You'd think that this would be any easy toy to shred, those legs look like a lot of fun to pull off. The King Crab has been gnawed quite a bit, but so far it has held up admirably. After a trip through the washer it looks brand new again. Despite all the biting and shaking, it has yet to split a seam. Pros: Sturdy and well-made. 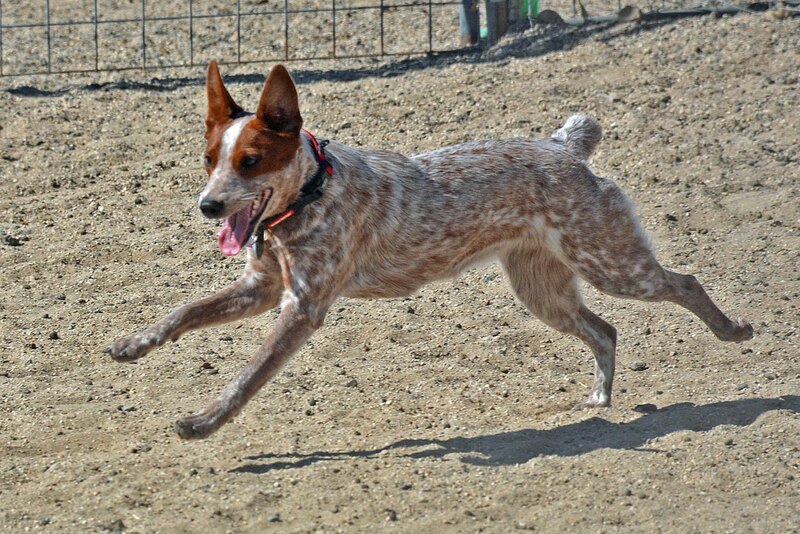 Flappy legs make it fun to shake. Holds up to mild gnawing. Bottom Line: It's not as awesome as the P.L.A.Y. Giant Squid, but the King Crab gets a lot of love around here. 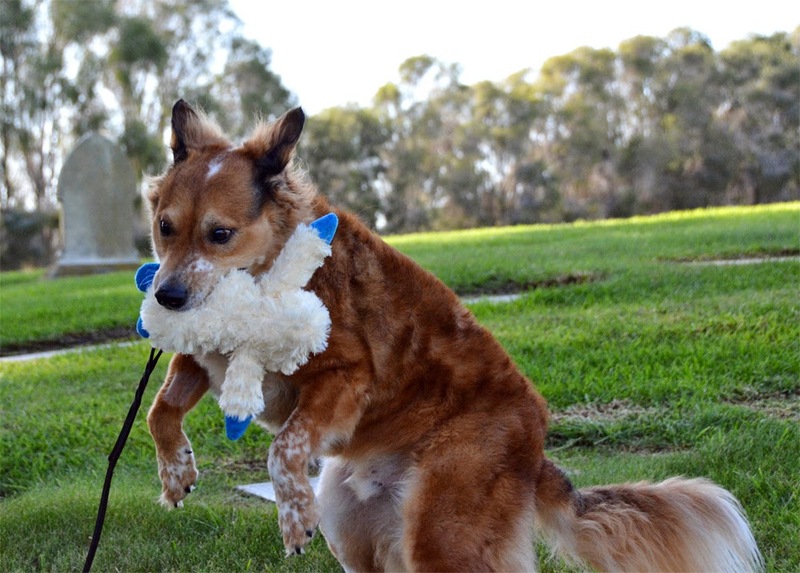 What's your dog's favorite stuffy? Good For: Leaving in foster puppy Darla's crate for her to find at bedtime. Making friend's with the neighbor's grumpy poodle. 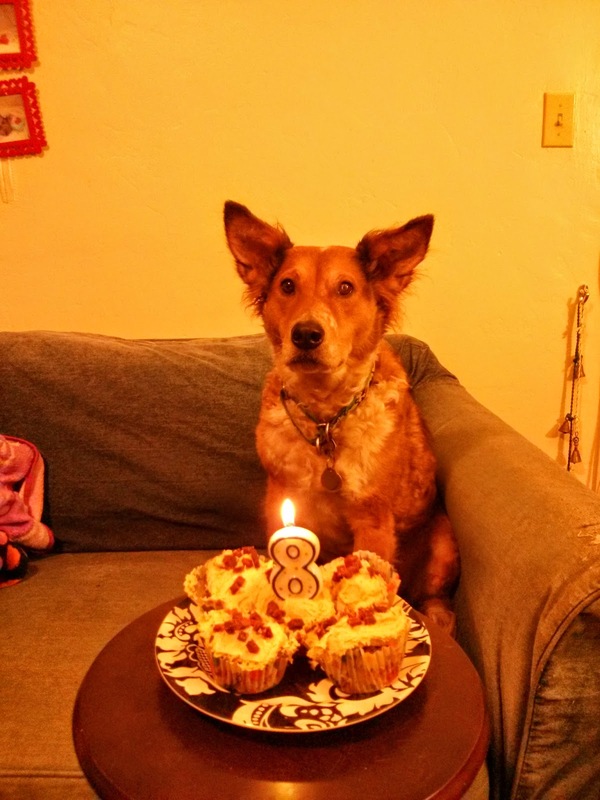 Not Good For: Dogs with poultry allergies. Training treats unless you break them up. How Much We Like Them: Enough to use up the whole bag rather than giving it away. Would you give your dog treats made with chicken fat if he was allergic to chicken? The dogs and I went on a road trip to Lake Tahoe last week. It was unseasonably warm and I'm told there should have been snow everywhere. It has been warm and sunny down here in Santa Barbara so I was somewhat unprepared for the colder mountain weather. It was nice though, I think I'd like to live up there. Brisbane definitely enjoyed the hiking and swimming. Ru enjoyed sitting on my lap for the long car trip. Brisbane, Ru and I just got back from a road trip and found our April BarkBox waiting! This month's theme is Spring Bark, such bright colors! I hadn't seen these Sojos Simply Lamb freeze-dried lamb treats before. They look like they'll be fabulous for training, and they contain no poultry, grains, or eggs. 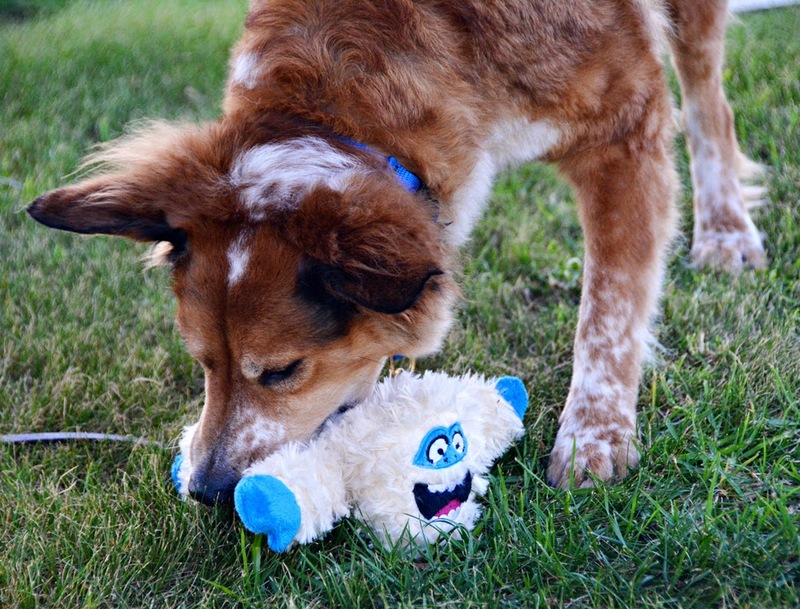 We're big fans of Himalayan Dog Chews, and this Yeti Corporation Yak Chew looks just as delightful. I bought Brisbane a large green petprojekt Squeaki Tiki toy years ago, it's still in our toybox. 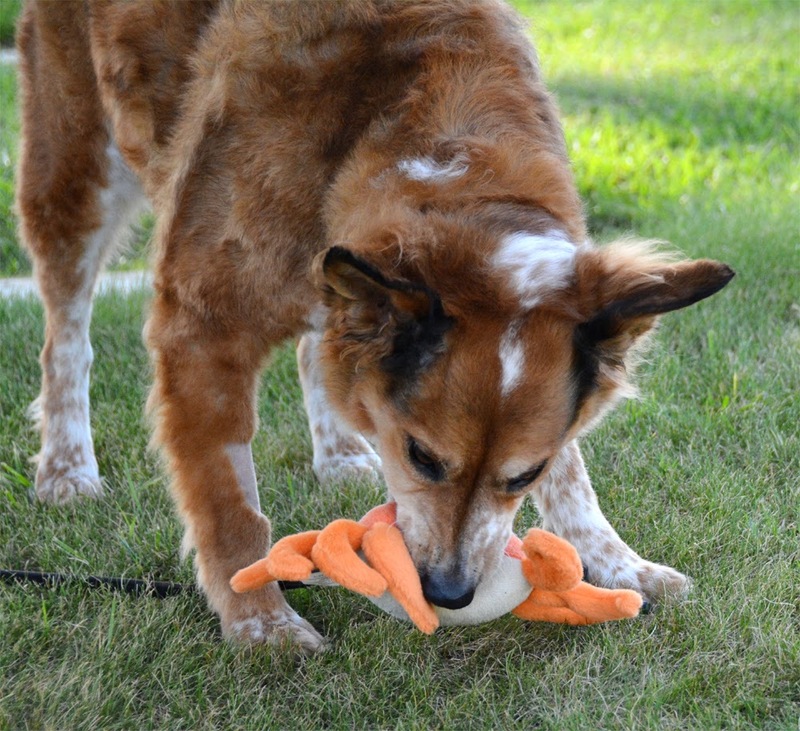 This little orange one is much softer and more flexible, with a quieter squeak. That plush bouquet is from BarkShop and is several toys in one. The individual flowers are wrapped in a fabric newsprint sleeve. Foster puppy Darla has been carrying these around today. This is a good puppy. She is laying there calmly and chewing on a dog toy. You know what she is not doing? Barking. Pestering Brisbane. Chewing on my slippers. I've been telling her what a good puppy she is, without being exciting enough to interrupt her chewing session. She is getting positive attention for doing what should really be a mundane, everyday activity. Why am I heaping praise on her for doing something unremarkable? It's because I want her to learn that chewing on her toys is more fun than chewing on my slippers. She already knows that grabbing a shoe or a slipper is a way to get my attention immediately. If grabbing an appropriate toy gets her ignored, but grabbing a forbidden object gets her some interaction, she could learn to grab my slippers whenever she wants some attention. When she does grab a slipper, shoe, or other random object, I don't make a big deal out of it. I simply remove whatever she's got and then present her with a toy. As soon as she touches the toy I tell her what a marvelous dog she is. If we have to go get the toy from another room, I like to bring it back to wherever she had settled down with her forbidden prize. After all, that was obviously a good spot to settle down and have a good gnaw. 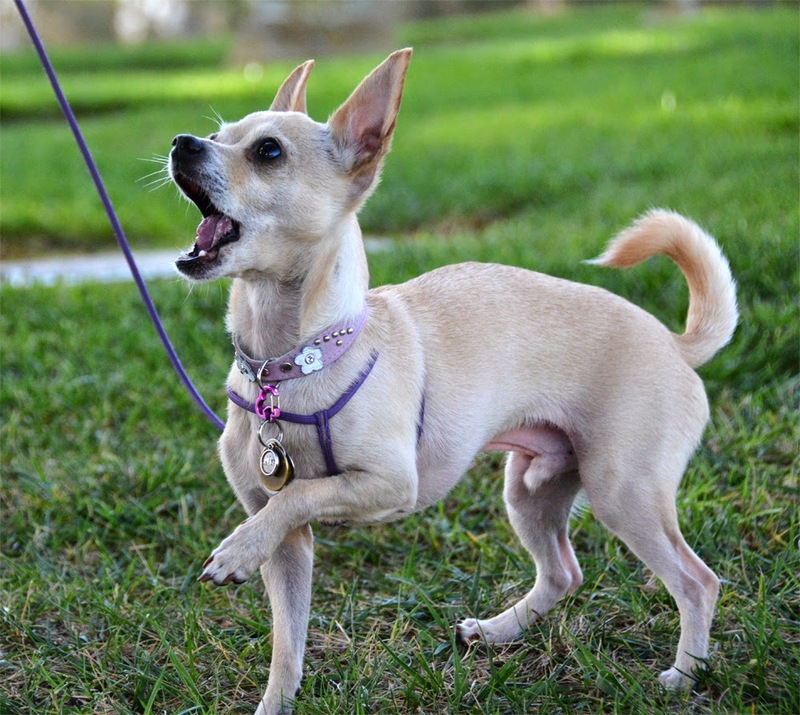 Management is also important for teaching a dog what is and is not appropriate to chew. 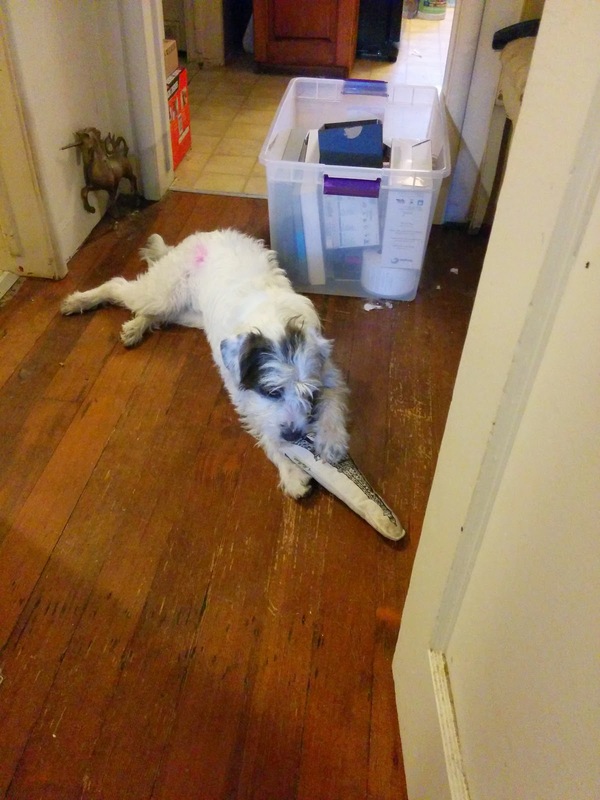 Darla is not a terribly destructive dog, she can play with a shoe for quite a while without damaging it. If she had a history of destroying things, I would be much more careful where I left my slippers. Since she's pretty benign, I can leave my shoes on the floor and we can work on learning the difference between puppy toys and everything else. I'm hoping this will help Darla if she gets adopted by a family with kids, because we all know that kids tend to leave stuff all over the place. 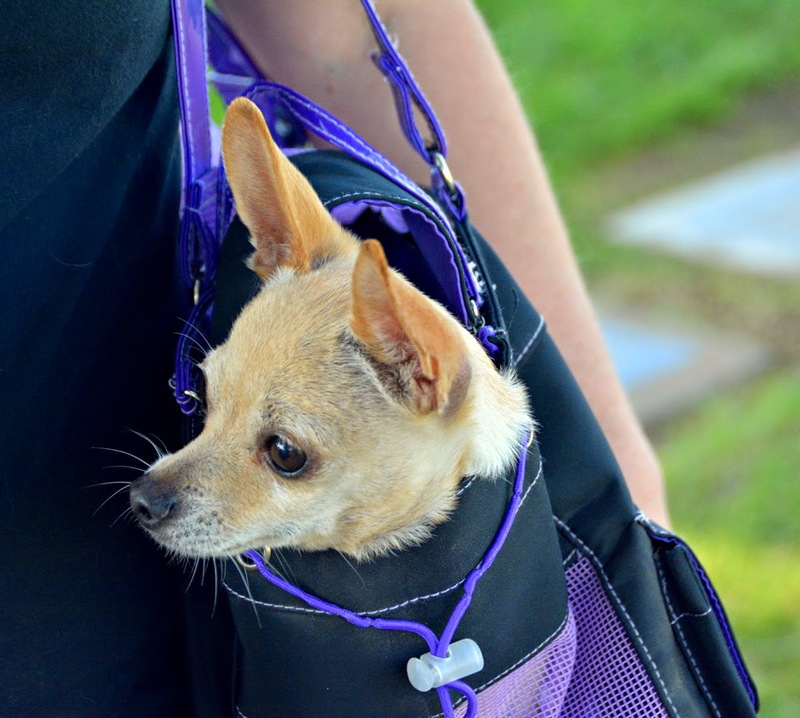 The Fetching Dog Carrier is a purse-style dog carrier intended for small-breed dogs. 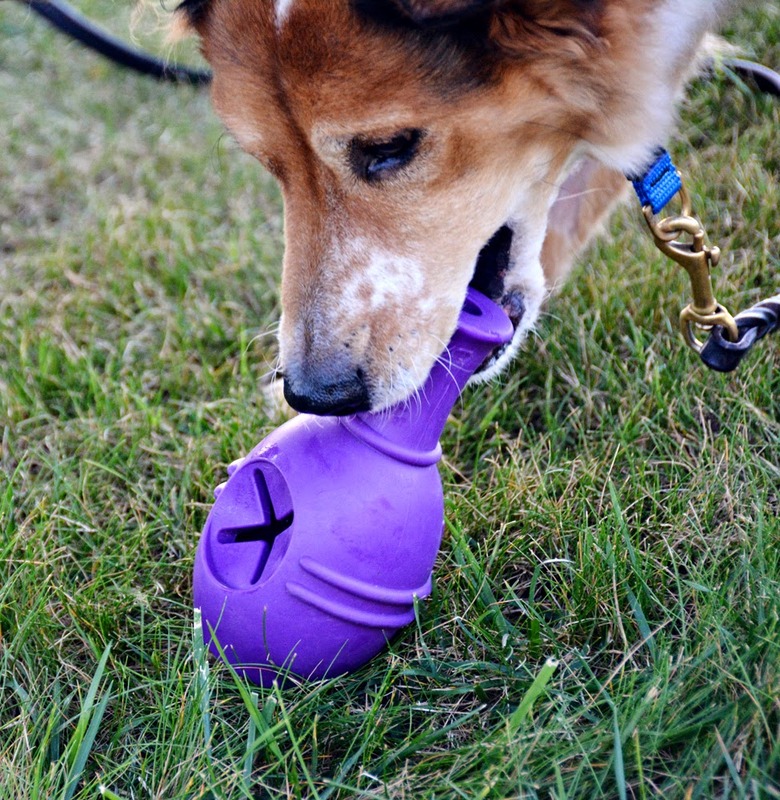 It features bright purple patent leather accents, including a bone charm. 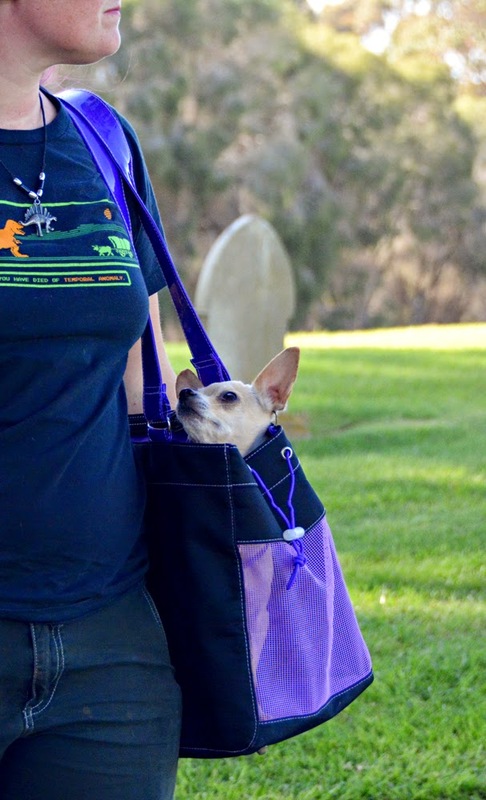 There are two outer pockets for holding things other than dogs, and a tether inside the main compartment for keeping your dog inside the bag. When I tried to research my original Fetching grommet purse, this was the bag I kept finding. It's much more my style, and was clearly far more popular than the sea green leather one. This one is also much more obviously a dog carrier, whereas the grommet purse mostly just looks like a purse. 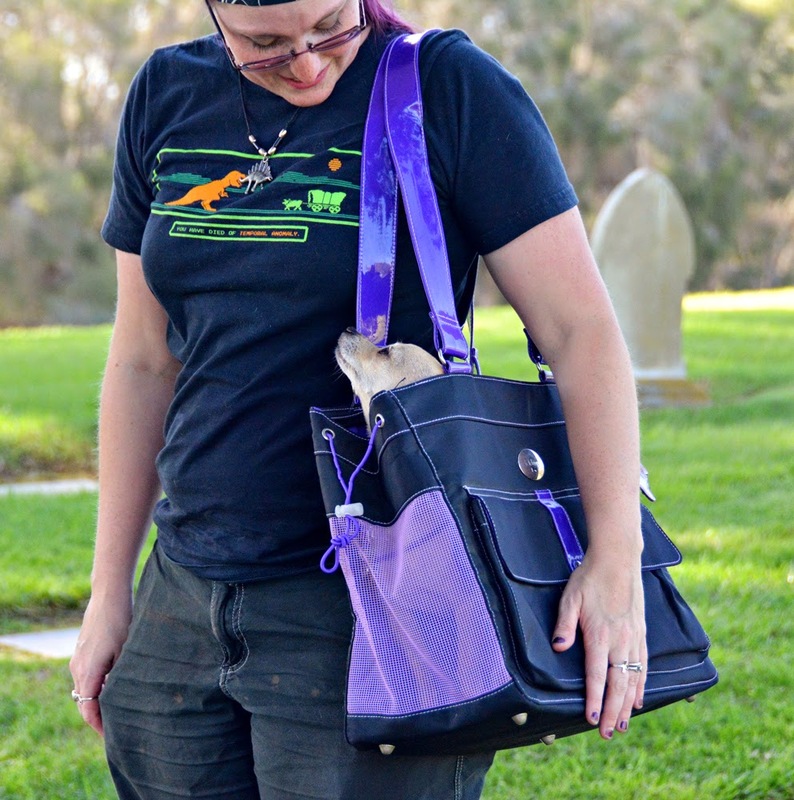 From the bright purple mesh to the bone-shaped charm, this bag immediately declares itself as a dog carrier. It's quite roomy for a dog carrier, too. This purse basically swallows Ru. 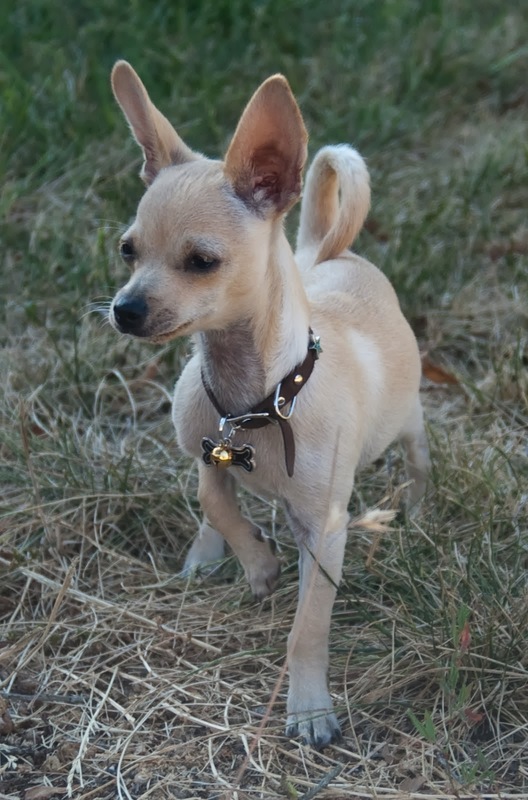 He's about 6.5 pounds, and there is enough space for him to lose his balance and fall over. Standing up and turning around is no problem, and I could stick a comfy blanket in there if I wanted to. This bag could easily hold a much larger small dog, maybe one close to 20 pounds. I think the bag can hold more dog than I would like to carry in a purse. Ru could comfortably spend quite a lot of time in there. This would be a good choice of carrier if Ru and I had a long commute on public transportation, or if I intended to bring him with me to a desk job. Unfortunately, this Fetching dog carrier would not make a great crate or home base for Ru, because the ends do not open. The only door is at the top, so Ru could not comfortably get himself in and out of the purse if I put it on the floor. It also does not close all the way, which sort of limits its usefulness for me. I always keep a small dog carrier in my car because I never know when I will need one. 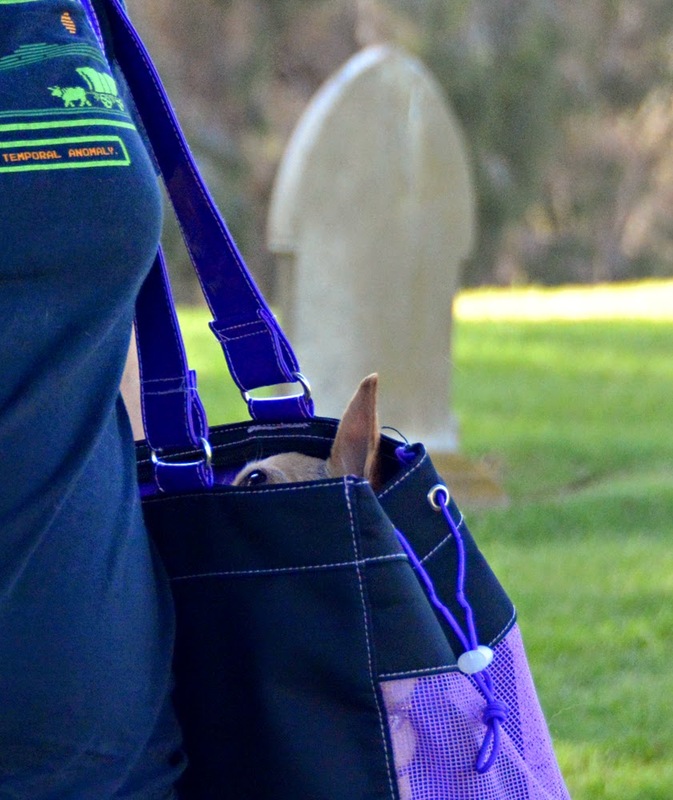 I have used my assorted dog carriers to tote Ru around when he was sick, and once or twice to sneak him into a place where dogs were not allowed. More often than not, I end up putting something else in the carrier. The bag that lives in my car right now has contained a large alligator lizard, an injured kingsnake, a sick cormorant, an injured crow, a canary, and a hairless guinea pig. Obviously it is necessary that my emergency pet carrier close securely. While the grommet purse and my skull carrier both work, this pretty purple purse just doesn't make the cut. There is a mesh panel that zips across the top of this bag, but it is only attached on the long sides. The short sides of the carrier remain completely open. There are elastic drawstrings and toggles to reduce the size of the opening, but this doesn't actually work very well. If anything it just makes the top gap open even further. Ru can wiggle himself out with minimal effort and the bag would be absolutely useless to contain a cat or anything other than a somewhat trained dog. Pros: Stylin' purple and black color scheme looks amazing even though this bag is several years old. Roomy enough for a dog approaching 20 pounds. Lots of ventilation. Cons: Does not close securely, dog can easily escape. Totally not subtle about being a dog purse. Elastic end drawstrings have stretched out over time because elastic has a limited lifespan. Bottom Line: This is yet another product of the dog boutique era of the turn of the century. The previous sentence just made me feel incredibly old. Is your dog small enough to fit in a purse? Honest Kitchen Quickies are stinky little heart-shaped treats that come in a cute little tube. 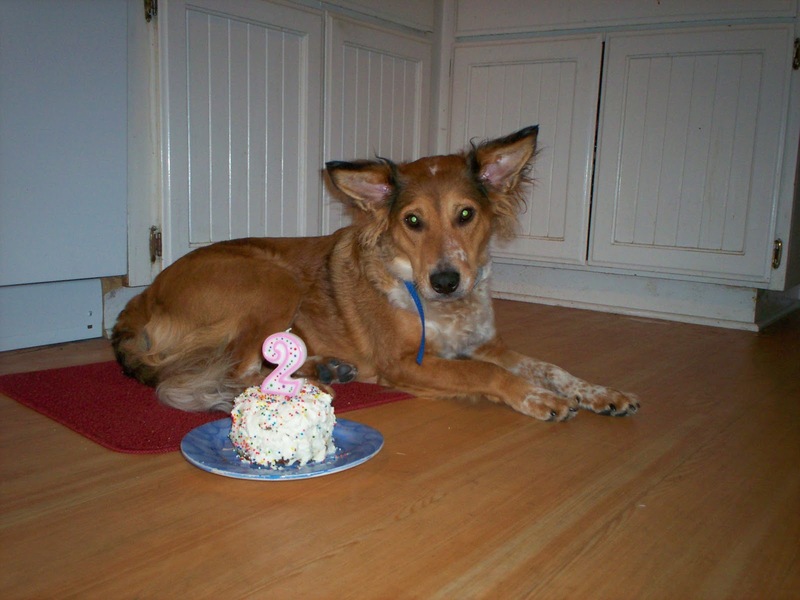 They are intended to be quick and easy training treats, and are just the right size for regular-sized dogs. They are made from nothing but dried haddock fish, with just 1.1 calories per treat. Good For: High value training treats. Hiding in food puzzles. Getting attention by rattling the can. Hiding the tube in my pocket. Not Good For: Dogs that don't looooooove fish. How Much We Like Them: Not enough to use them for training unless I feel like having my hands, my treat bag, and my dogs smell like fish. Everything smells like fish. So much fish. Fish. Have you tried any Honest Kitchen treats yet? 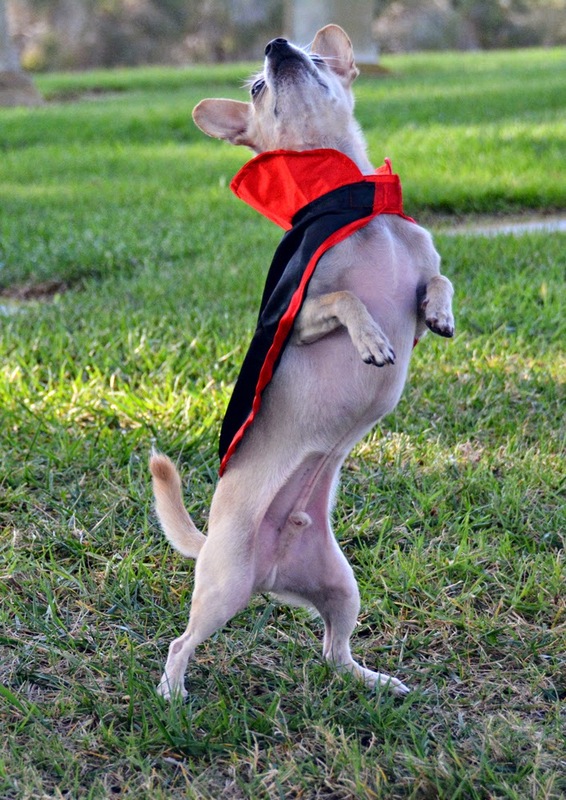 Capes aren't the most practical dog accessory, but they are among the coolest. 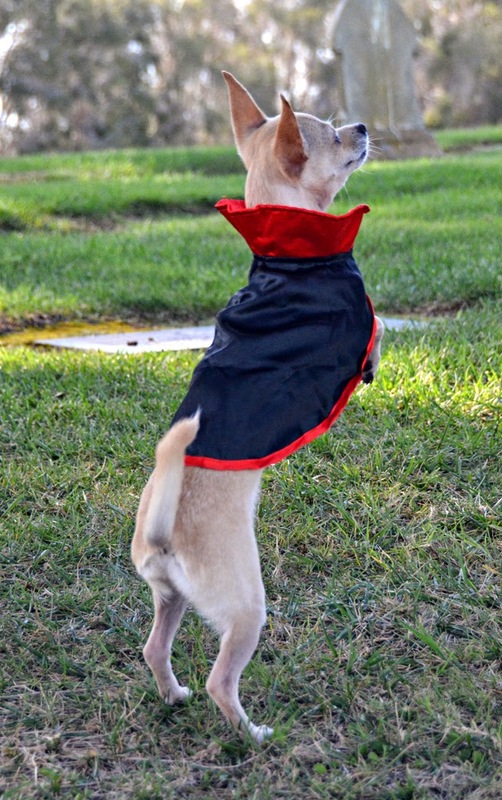 This is actually a cat costume, it's a little vampire cape with a velcro closure in the front. Ru looks totally adorable in a cape. As cute as it is, this cape is a little short for Ru. This seems a little odd because it is intended for a cat, and most cats are a lot bigger than my chihuahua. Ru is about 6.5 pounds, while the smallest of my three cats is about 10 pounds. The cape might fit a kitten, but I think it's a little better suited to a tiny dog. The Delca Corp Adorable Snowman is a plush dog toy that lives up to its name. The adorable fuzzy exterior and unique squeak make this toy irresistible. The Adorable Snowman arrived in our January Allergy-Friendly BarkBox, and was an instant hit. Ru dragged it out of the box when I set it down to take a picture. Ru loves stuffies that are bigger than himself. Brisbane also adores the snowman, and it has endured a liberal amount of squeaking and shaking. Who else loves the Adorable Snowman? All of the foster puppies! Pros: Durable and fun to bite and squeak. The squeaker itself is also durable, it still works after a whole ton of squeaking. Cons: That white fur is going to get dirty fast. Bottom Line: Thank you BarkBox for sending us a toy that my dogs adore and that I would never have picked out myself. 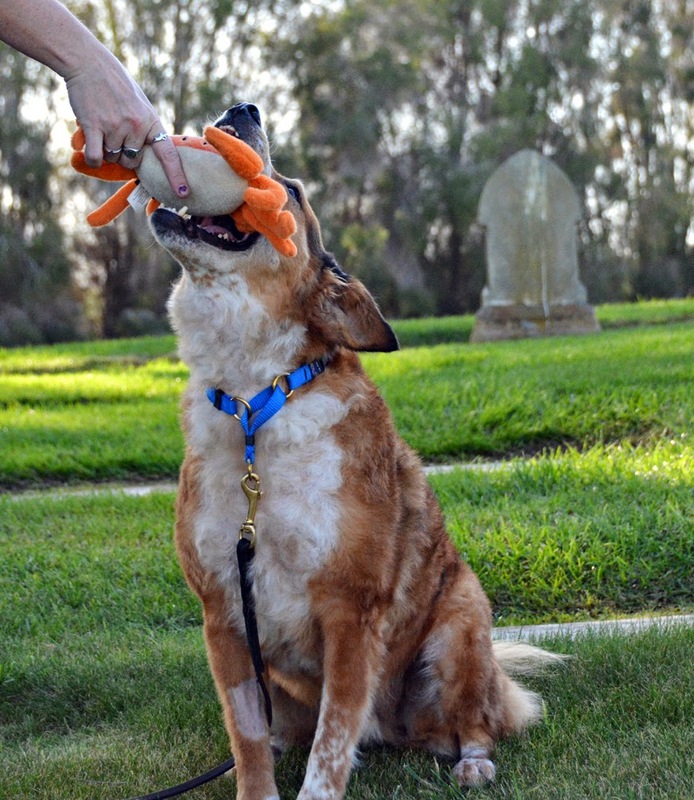 What is your dog's favorite stuffy? Missing Link's Ultimate Skin and Coat Supplement is a dog food supplement designed to provide omega 3 fatty acids. It is intended to promote healthy skin and nice soft hair, as indicated by the name. I am super skeptical about dietary supplements, but I know there is some actual evidence that omega 3 fatty acids can help a dog grow a nice coat. This is one of the products recommended by some of my internet dog friends. Brisbane has tons of allergies and several months ago had scratched himself bald in places. In an effort to get him to look less moth-eaten, I started looking for something to add to his usual diet of high-quality kibble and fish oil. The premise of Missing Link products is that they are supposed to fill the nutritional gap between fresh raw foods and processed dog foods. The only problem is that it's also a processed food. Missing Link supplements are shelf stable and highly processed. That said, Brisbane's coat is growing in nicely. I'm not sure if I can entirely credit the Missing Link for that since I also started giving Brisbane Mirra-Coat at the same time. Either way, his coat is finally filling in. I've used up the whole can of the other supplement though, so Briz is just on the Missing Link Skin and Coat Supplement now. What do you use to keep your dog's skin and coat nice and shiny? 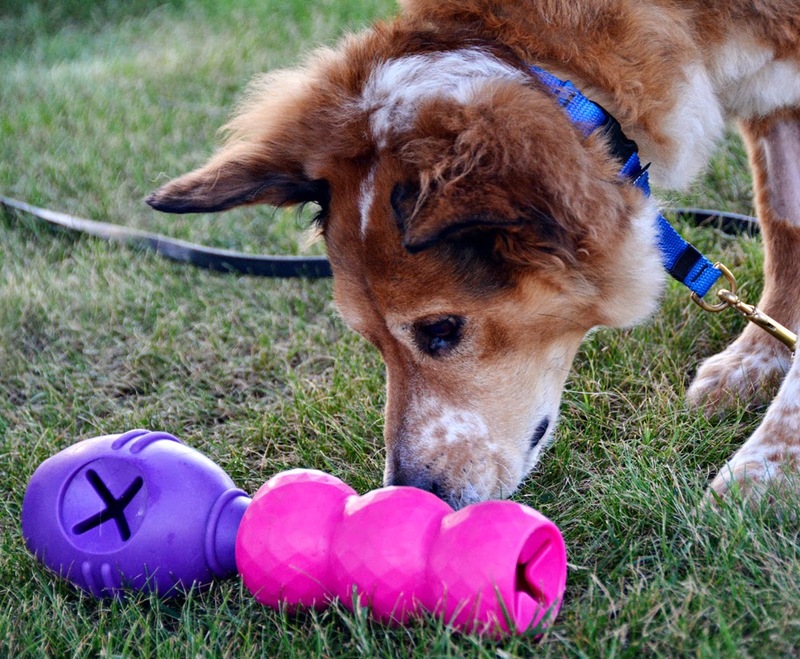 The Kong Genius Leo is a roller-type puzzle toy shaped a bit like a bowling pin. It is made in the USA from natural rubber, and comes in three different sizes. Ours is the large size. The Kong Genius Leo was once originally sold as the Canine Genius Leo. The Kong Company bought the rights and hopefully made the Canine Genius people very successful. There are two Kong Genius toys. The Leo is named after Leonardo DaVinci, and the Mike is named after Michelangelo. The Leo has a funnel-shaped top, and x-shaped openings at the bottom and on the side. 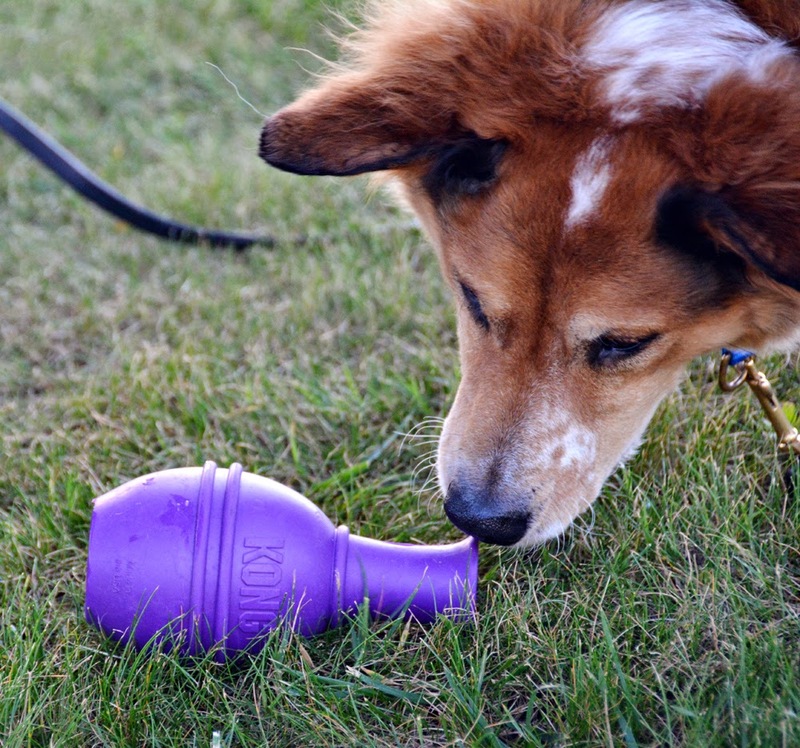 Kibble can be loaded through the top and falls out as the dog rolls the toy around. For a more difficult puzzle, the neck of the Leo can be shoved through one of the x-shaped openings in either the Mike toy or another Leo. This allows the kibble to fall freely between the toys. It also keeps the most vulnerable part of the Leo, the neck, safer from serious chewing. Provided I can keep it from falling out, I can fit a good cup of food in here. I should be able to funnel tons of food in here in no time, but the size of kibble I use tends to just fall out the other openings if I'm not super careful. Darla can spend quite a while getting her 3/4 cup of kibble out of the Leo. Briz would take a lot more time emptying the Leo if the holes weren't big enough for kibble to just fall out. I suspect our original Leo has slightly narrower holes. Three sizes mean there is a Leo small enough for Ru and big enough for a really big dog. Our Large is supposed to be for dogs up to 40 pounds, but it sometimes feels a bit big for 40-pound Brisbane. The Extra Large is big enough for a really big dog. It's not made to be gnawed severely, but the Leo will stand up to pretty much anything else. It's hard enough to be a tad rattley on the hardwood when it's got a bunch of kibble in it, but it's not terrible. That one flat side keeps it from rolling too far, and it's a pretty big toy. It doesn't open up and I can't see inside, but I can get a scrub brush in there. It's big enough for a variety of critters to bat around, and to hold a variety of foods. The lack of washability somewhat limits what I'm willing to shove in there though. The Hurtta Padded Y-Harness is a Roman-style harness lined with neoprene. It features an adjustable girth strap that closes with a quick-release buckle. 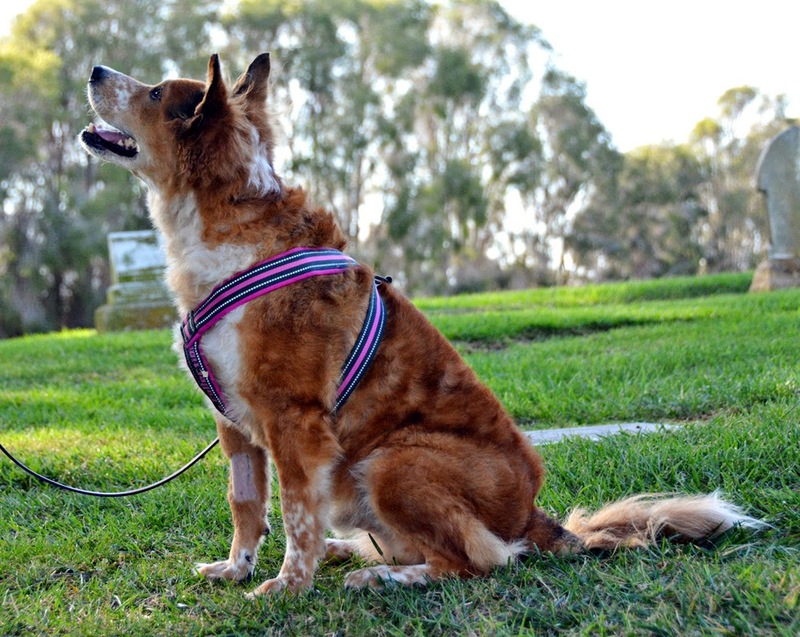 This harness is available in eight colors and seven sizes to fit dogs with chests 14-39". I really love the way these harnesses look, but I don't love the way they fit. While the chest strap is super adjustable, the neck does not adjust at all. The harness pictured here is a 35", but this is just the size listed on the packaging. Unlike most nylon harnesses, the end of the adjustable strap is not fixed at the end. This allows the Hurtta Padded Y-Harness to adjust down to almost nothing. The neck may not fit him, but I can adjust the chest strap of this harness all the way down to fit Ru. It looks pretty silly. The 35" measurement refers to the maximum size of the chest strap. Brisbane's chest is 26" around, and the neck is big enough that the straps interfere with his shoulders. I also have a 28" harness which fits his neck fine but rubs his armpits. There is a size 32" that might be just right for Briz, but I haven't yet had the opportunity to try it on him. Pros: Padded, reflective, tough, comfortable. Looks fabulous. Won't interfere with movement when fitted properly. Comes in way more sizes than most harnesses. Cons: With no adjustment in the neck, it either fits or it doesn't. Smallest size is too big for Ru. 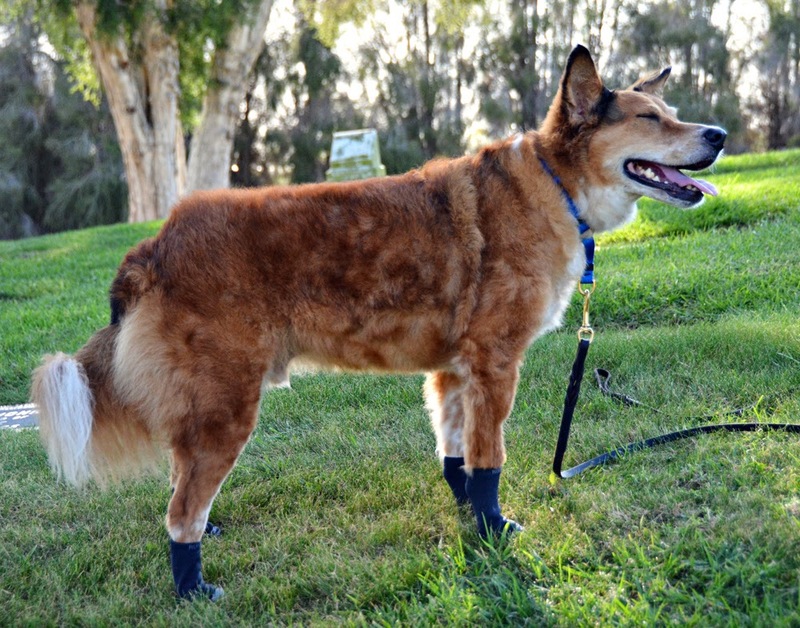 Neoprene may cause some dogs' fur to mat. Bottom Line: I really wish this harness fit Brisbane. It's so pretty. 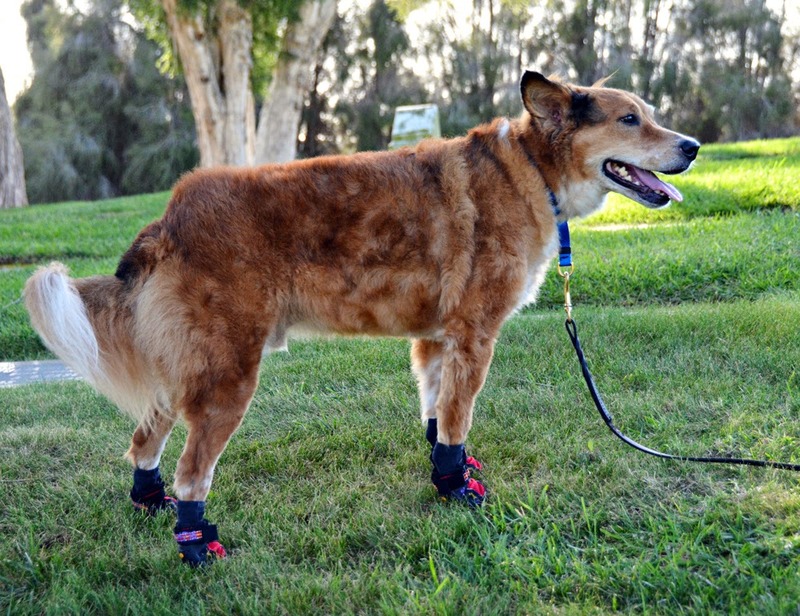 All the cool dogs are wearing them. 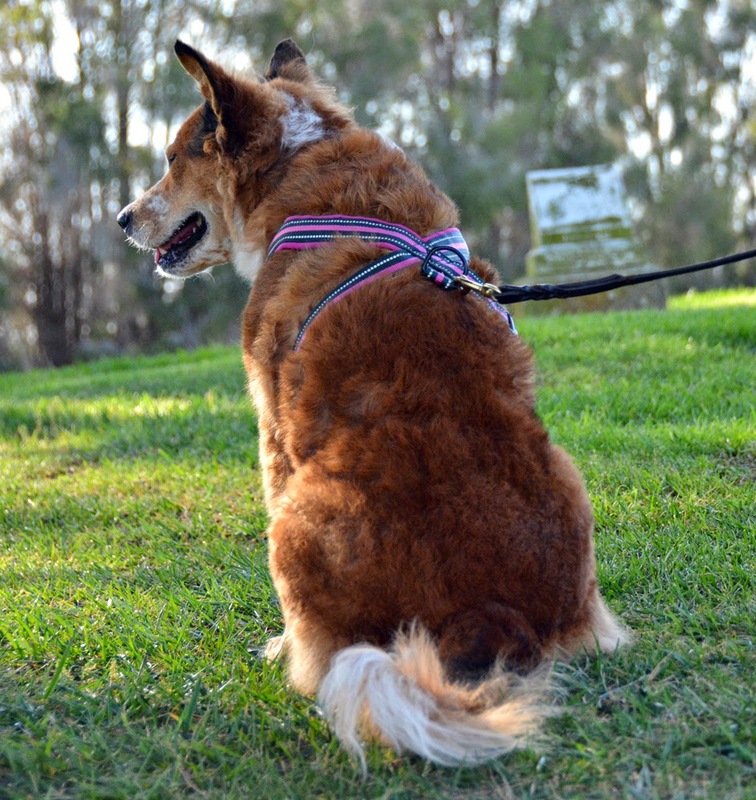 What's your favorite type of dog harness? This cup of Healthy Dogma Bacon Hearts arrived in our March Allergy-Friendly BarkBox. Unlike the Jamaican Bacon Hearts found on the Healthy Dogma website, these contain no poultry, eggs, beef, corn, wheat, soy, or gluten. They are made from peas, pea flour, tapioca, canola oil, cranberry, sweet potato, and of course bacon. Good For: Mid-value training treats. Popping into Kongs and the Treat-Dispensing Chew Ball. Find-the-treat games. Not Good For: Lasing very long. How Much We Like Them: They're half-gone already. 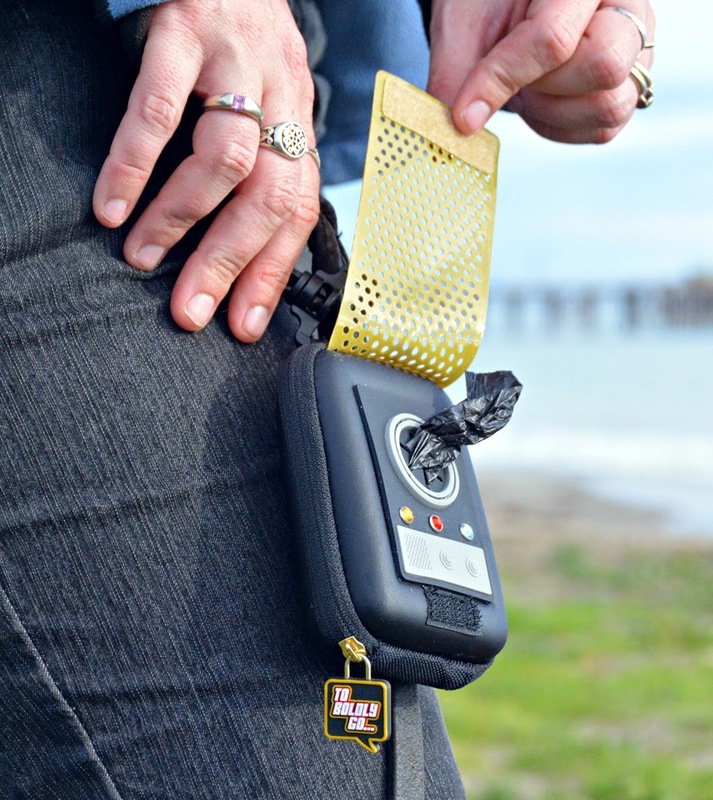 High on the list of super-nerdy dog stuff is this Star Trek Communicator Dog Bag Dispenser. This is officially licensed Star Trek Original Series merchandise, it's tough to get nerdier than that. I am very much a Star Trek fan, have seen every episode of every series (except the animated series but we like to pretend that never happened) and have a favorite captain. The Original Series is extremely nostalgic for me, and this poo bag dispenser is so awesome I have a hard time believing it actually exists. I don't like tying things on leashes, and I can't stand hard plastic bag dispensers rattling around and weighing down the end of the leash. I don't hang anything on any of my leashes these days, but when I did I only used light fabric poo bag holders. This bag holder is made to clip onto leashes, but I keep it on my purse. It's been on there for several months now and still looks brand new. It is lightweight and look awesome, and fits regular poo bag refill rolls. Pros: Lightweight, durable, and amazing. Cons: The plastic clip attaching it to my purse is probably going to fail eventually and need to be replaced with a carabiner. Bottom Line: See that zipper pull? It says "To boldly go..." This goes really well with Ru's Star Trek collar and my Star Trek pajamas. To what fandoms to you belong?